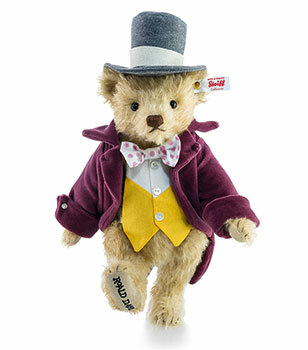 Steiff Willy Wonka Discounts Apply ! ‘Mr Willy Wonka is the most amazing, the most fantastic, the most extraordinary chocolate maker the world has ever seen!’ Willy Wonka is a chocolate-making genius who relishes nonsense and cannot abide ugliness in factories. But he is not just a genius with chocolate. Mr Wonka is also a very well-travelled man, having been all the way to Loompaland and to the further reaches of outer space. He is a thoughtful man, who knows that only a child like Charlie Bucket could ever be the right person to take over his beloved Chocolate Factory. And he is a clever man, with a knack of getting the right people to do the right things at the right time. In short, Mr Willy Wonka is a man who knows a thing or two. Inspired by Quentin Blake’s original illustrations, Steiff bring their scrumdiddlyumptious style to the beloved Roald Dahl classic Charlie and the Chocolate Factory with this delicious eccentric candy-maker Steiff Willy Wonka who is guaranteed to draw you to the delicious world of an enduring story. thanks he arrived safe packed well and free posting was a bonus he is more than I expected from the picture.